Did you catch our Valentine’s Day soirée earlier this week? I am sharing our bar cart today from the party. I prefer to have a designated cocktail spot for guests to mix up drinks so they feel comfortable to serve themselves when their drink needs refreshing. I also use my bar cart to store liquor in my dining room and change out the decor seasonally. For this party, I served Jackson Morgan Southern Cream in salted caramel and peppermint mocha. I added a few of my favorite liquors on the bottom that I felt would mix well with these flavors including a vodka and whiskey. I keep sparkling water on hand too in case any guests need non alcoholic refreshments. I used the crest from the Dixie Designs invitation to create an art piece that incorporated the invitation design on the bar cart. The heart coffee mugs were perfect for spiked coffee or hot chocolate. 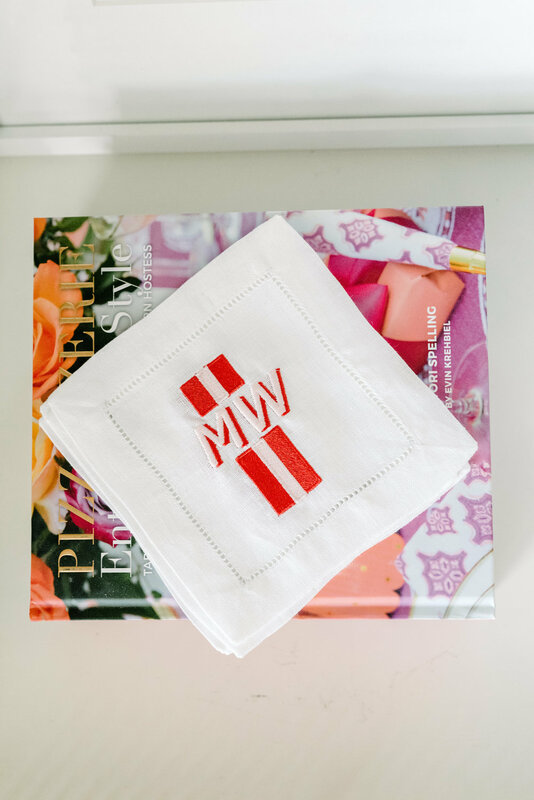 Lettermade linen napkins in blush and red stripe were great for sipping cocktails. Although I am not a fan of candy hearts, I love the way they look so I placed them in fancy footed dish for decor. It is no secret we love Pizzazzerie, her book was the perfect bar book. I also think it would make a cute Valentine’s Day gift especially paired with a bottle of Jackson Morgan. On the bottom, I had a mirrored tray with liquor, simple syrup, candle, mini. boxwood, and a cocktail shaker, I used the remaining ranunculus flowers from the table centerpiece and created this arrangement with pieces of boxwood. Stay tuned for cocktail recipes from our brunch. All images Christy Wilson Photography. You can shop this post below. Special thanks to Juliska and Mostess Box for partnering with us on this party.